Has an injury or decay left you feeling insecure and hesitant to smile? Let Doctor Tillman help you regain your smile, and freely laugh with confidence without having to wear a temporary crown or schedule a follow-up appointment. Dr. Tillman and our Eugene team will create a personalized treatment plan to design, mill, and place a completely custom-made crown in a single visit using our in-house CEREC, an innovative machine that allows us to make your custom crown the same day. 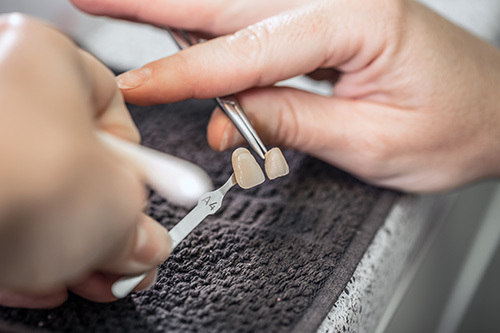 Dental bridges span the gap created by one or more missing teeth, providing a balanced bite, larger chewing surface and stability for existing teeth. A bridge is made up of two or more crowns for the teeth on either side of the gap used as anchors. These crowns are called abutment teeth. Dental bridges are supported by natural teeth or implants. Dental or porcelain veneers are thin, custom-made tooth-colored shells designed to bond to the front of the tooth to change create a better appearance. Dental veneers can be made from porcelain or from resin composite materials. Porcelain veneers resist stains better than resin veneers. Porcelain also better mimic the reflective properties of your natural teeth. Discoloration due to reasons that can include root canals or even certain drugs.